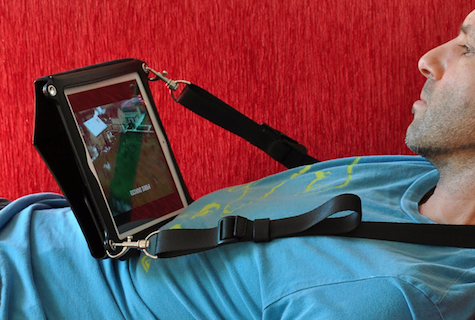 Slip your iPad 2, 3, or 4 into Across, and tuck in the rear flap to snugly secure your iPad. Observe the precise cut-outs for all necessary port access in the premium black leather. Fold over the stiff cover segments with quick-release Velcro fasteners. Clip the included rotating 1 inch wide x 4 foot long adjustable quick-release nylon shoulder strap into two of the four exterior perimeter holes, and head out into the world with your iPad protected for travel and poised for usage. Across is four things: slim tote, protective case, horizontal stand, and standing-position access porta-shelf. The latter is Across’s most notable feature. Additional photos are here. View the photos and video at Strotter’s web site to see Across in action. By day two with it, you will be comfortable and familiar with its different positions for travel and usage. Typing and swiping while standing seems awkward at first, but you quickly will learn how to maximize Across’s stand-up mode. The materials and construction on our leather evaluation unit are very good quality. There is room for improvement on the generic metal snap clamp, and I personally prefer a wider shoulder strap, but those are minor gripes. Black is black, although Strotter “will definitely introduce new colors,” according to the CEO. He believes strongly in “the feel of leather in a world full of imitations,” and offers a synthetic Across for customers who are on a budget or who do not want leather for any reason. According to our research, most people, when working on an iPad, meaning typing or web browsing, prefer the landscape mode. Same of course goes for watching movies. When they use the device as a magazine, or a book, they simply tend to hold it in hands. When one folds the flap completely, the case becomes flat, and one can use it either vertically or horizontally. Our task was to make the case easy to use and the package slim and attractive. Keep in mind, Apple’s smart cover also works in landscape mode only, for a reason. BTW, when used on the go as a mobile desk, both landscape and portrait modes are available. Strotter is a new company. MyMac encourages them to refine and expand their product lineup, to continue to develop innovative solutions we didn’t know were possible. MyMac Review Rating is 8 out of 10, including a bonus point for innovation. “There is room for improvement on the generic metal snap clamp…” John, would think you are talking about the improvement of the “generic” looks of the snap, and not the way it works. The reason the snap does indeed look somewhat generic (we reluctantly admit) is because this type of a snap-bolt functionally works best. There are some variations of this snap on the market, but they are very similar. When developing the case, we looked at about a dozen of different designs. This type won: it is light, the trigger is easy to pull with a thumb, the hook is easy to insert and take out from the grommet, and the strap slides easily through the loop, which is critical. The snap is hand polished (which is not cheap) and electroplated. We had a great opportunity to gather customers’ feedback at the MacWorld Expo in San Fran earlier this year. And we did. We asked questions about the strap width, hardware, leather quality, stitching, lining, fit, etc. People liked our products; as a matter of fact, we got many compliments on quality, and we did not hear any negative comments. However, some said they wanted different colors.